Still a wild area today echoing to the cries of buzzards and ravens, before the Conquest this district was a Welsh commote known as Ewyas. Hundreds were already an established feature of much of England by the 10th century, but west of the Golden Valley, Ewyas remained frontier country beyond the reach of Anglo-Saxon administration. Some time after the arrival of William the Conqueror in 1066 all this changed, and the Welsh border was given to the Marcher Lords to govern. This region went to the de Lacy family who imposed not only the castles which are such a feature of the villages along the border, but firm government for this district, which became the Hundred of Ewyas Lacy. George Marshall (Transactions of the Woolhope Club, 1936) puts the date at 1125. The idea of the Hundred as an administrative unit probably stems from the much earlier regio, possibly a hundred households, or one hundred hides, later 10 to15 parishes. The Hundred courts administered customary law. The Hundred itself was divided into units: the Court Baron and Court Leet; manorial units adminstered by the steward of the Lord of the manor, who was able to inflict fines, oversee transfers of property and generally protect the interests of his employer. 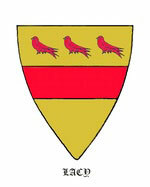 The lordship was held by the de Lacy family until 1241, when at the death of Walter (ll) de Lacy it was divided between his two granddaughters, Margery and Maude. Succession from Margery's share is well recorded; it devolved to the Neville family until properties were sold piecemeal by the Marquis of Abergavenny in the 1920's. Maude's share is not fully understood; after devolving through the Mortimer family it was later held by the Earl of Leicester, and thereafter properties appear to have been sold off in the late 17th century; the remainder of the manor being bought by John Jefferies, Esq.of Brecon, c.1700. Politically, the Manor of Ewyas Lacy was perceived as being "in Wales" throughout the medieval period. In the Act of Union of 1536, establishing the boundary between England and Wales, most of Ewyas Lacy was allocated to Herefordshire, although a few fragments were split off into Wales in neighbouring Monmouthshire. The parishes in Ewyas Lacy Hundred are Craswall, Cusop, Llancillo. Llanveynoe, Longtown (with Clodock), Michaelchurch Escley, Newton, Rowlestone, St Margarets and Walterstone. (The definitive reference for these parishes in Herefordshire is taken to be the Royal Commission's Inventory of the Historical Monuments in Herefordshire (Vol 1, p xiv-xlvi)). The ancient church of Clodock, a pre-Norman foundation, plays a central role in the evolution of four of these parishes (Craswall, Llanveynoe, Longtown and Newton) , which until the 19th century were 'townships' in the parish of Clodock. 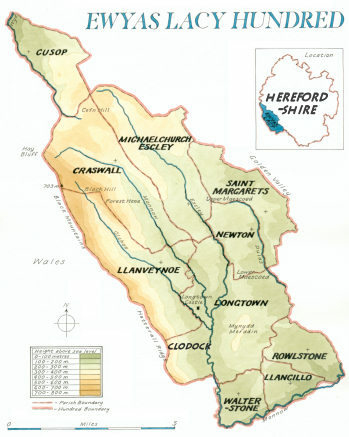 Ecclesiastically, all but one of the parishes in Ewyas Lacy Hundred were in the Diocese of St David until 1852 when they were transferred to the Diocese of Hereford; the exception is Cusop which has been in the Diocese of Hereford since earliest records. There is as yet no comprehensive history of the area, and it is hoped that the wealth of information available from the Archive Index will contribute material for such a study. Flower-Smith, Priscilla. (2013) The Hidden History of Ewyas Lacy in Herefordshire.